Alex Howell needed to make a decision on her area of study for college, and she had some specific interests in mind. One of her main goals was finding something that would allow her to make a difference on a large scale. 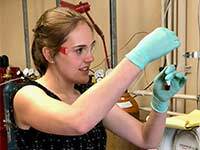 When she came across the energy systems engineering (ESE) program in the College of Engineering and Applied Science (CEAS) at the University of Wyoming, she was intrigued because the curriculum involved issues with impacts on the global stage: energy research and consumption. A standout student from Morrill, Neb., she had many educational opportunities elsewhere. She chose UW to follow the legacy of her parents and some family members, all of whom attended the university. After earning her bachelor’s degree in ESE and environment and natural resources in 2017, she currently is pursuing a master’s degree in mechanical engineering. Her background as an undergraduate helped her transition to her master’s program. “I think the most beneficial part of the ESE program was the diverse class work requirement,” she says. “I was taking mechanical engineering classes, but also was enrolled in classes like geological climate change, natural resource economics, international environmental law and management. Howell’s master’s research involves thermochemical pretreatments and subsequent combustion of solid fuels, like coal and biomass. She strives to optimize the performance of biomass integration into technological applications, particularly energy generation. She is also interested in utilizing technology to develop innovative solutions to improve the human environment and enhance existing systems. The CEAS has begun to implement new methods and curriculum requirements for the ESE degree program, which will enhance student experiences. Howell attributes much of her success and knowledge base to the ESE program. “I would let (prospective students) know that they are in an exciting and rapidly growing field,” she says. “I would tell them that they have already chosen a great field that will teach them to be innovative and creative problem solvers with the technical background to implement solutions in a wide variety of fields.